NaNoWriMo @ Oakton: Discover Your Story | What's On My Nightstand? National Novel Writing Month (NaNoWriMo) is a fun, seat-of-your-pants approach to novel writing. Participants begin writing November 1. The goal is to write a 175-page (50,000-word) novel by midnight, November 30. Check out our NaNoWriMo LibGuide for more information on NaNoWriMo, Oakton Library’s NaNoWriMo workshops and write-ins, and helpful resources for our budding NaNoWriMo novelists. Interested in joining? The Library is pleased to host a series of pre-NaNoWriMo workshops led by Lori Oster, Assistant Professor of English at Oakton to help people prepare for November 1st. 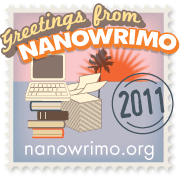 With just one week left before NaNoWriMo 2011 officially begins, we can now focus on doing a teensy tiny bit of pre-planning. This workshop will help you iron out some of the larger aspects of your story so you can sit down on November 1st with some semblance of an idea of what you plan to write. If you’re a planner, this workshop is for you. Remember, you cannot actually begin writing your novel before November 1st, but you can do a bit of planning. Here are links to the handouts from the previous three workshops.